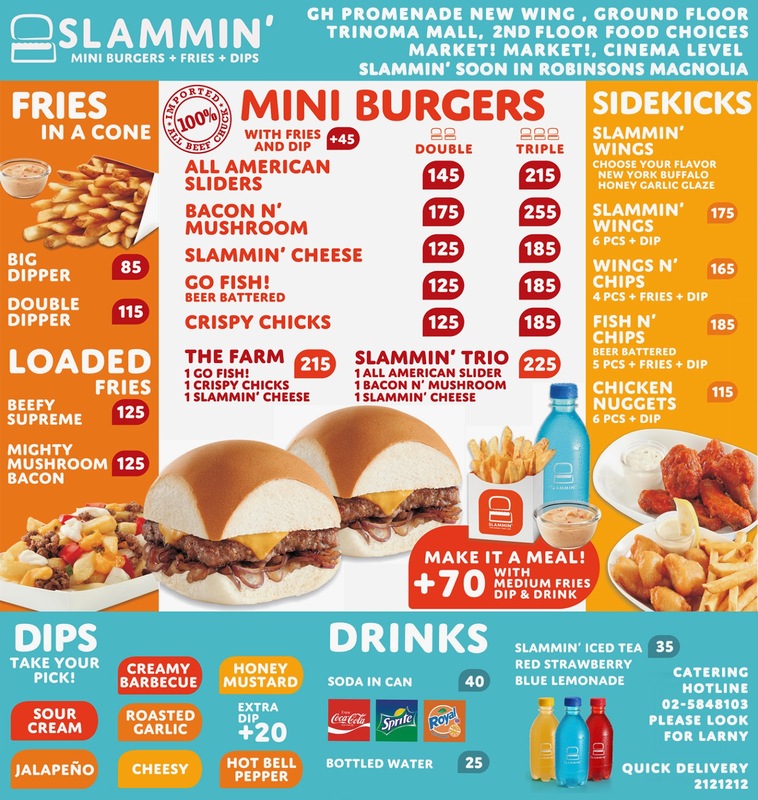 I dropped by Promenade Greenhills last week to try this cute burger joint named Slammin' Mini Burgers, the revamped version of Slammer Burgers. The place is quite simple, with a few tables and a counter table. For the Mini Burgers, we tried their limited-edition mini burgers: Black Box Creations (Php 185 for double, Php 265 for triple). The server suggested that I order Triple so I can try all flavors: John Candy, Romeo and Juliet & The Big Kahuna. John Candy is topped with salted caramel, sauteed onions, cheddar and bacon; Romeo and Juliet has bacon, melted cheese, strawberry jam and salted butter; The Big Kahuna is topped with pineapple chunks, sriracha mayo, teriyaki glaze, cheddar and bacon. 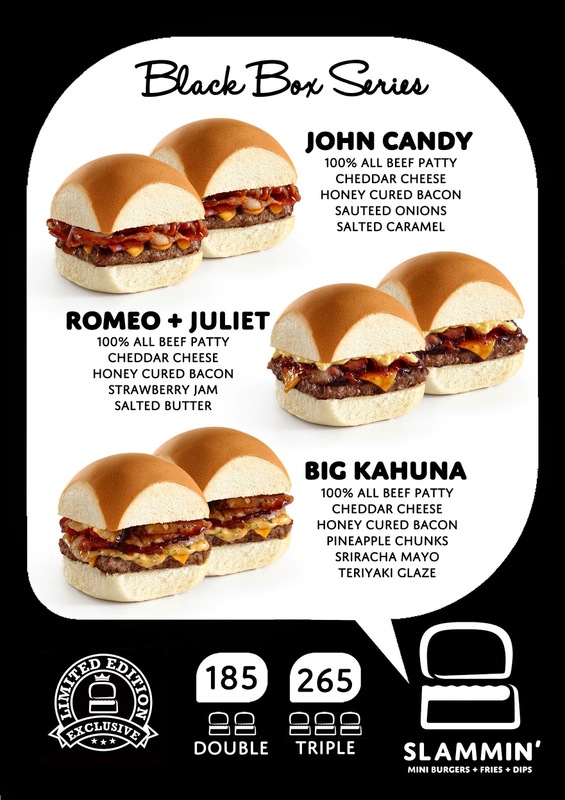 Romeo and Juliet was the most interested flavor for me, as the strawberry jam blends well with the burger patty. We also got their Mighty Mushroom Bacon Loaded Fries (Php 125) and Fish N' Dips (Php 185). Mighty Mushroom Bacon is generously topped with cheese that it was more than enough for two. I was surprised with the size of the serving for the Fish N' Dips as well. The Fish N' Dips goes really well with the sour cream. I wasn't able to take a photo, but we loved the Blue Lemonade (Php 35) with our food. I enjoyed our dinner at Slammin' Mini Burgers, the service was excellent and the food was very affordable. The only thing I think they should improve on is the ventilation as we really smell like burgers after our visit. Otherwise, I would love to dine in and also try their dessert, Slammin' Iceberg, next time. Thanks to Slammin' Mini Burgers for having us. Other locations are Market Market, Trinoma and soon to open in Robinson's Magnolia. This looks really good! Especially the Mighty Mushroom Bacon Loaded Fries!! Oh my!! Drool!! I was just at GH last Saturday! Sayang! These look so good I have to give it a try! Luckily, there's one at Trinoma! WOw the black box series look interesting! The staff suggested it to me kasi tagal ko pumili. hahaha.